To switch the Tour avalanche transceiver to Transmit, depress and then slide the three-position switch on the front face of the beacon so that it’s flush with the housing. How to tell at a glance if the beacon is transmitting? Look for a light flashing through the pouch’s mesh material. The search interface is simple: two-digit LCD numerical display, five LCD directional indicators, and one single button. Firmware can be upgraded. The inaugural version (as well as the latest version for its big brother DSP) is 8.2 (as of Fall 2011). Also be careful to keep any magnet away from the beacon. (Note that magnets are used in some jacket clasps, glove keepers, and professional-level two-way radios.) Although the Tour/DSP three-position switch looks mechanical, its operations are actually magnetic, and a magnet in very close proximity can switch modes. But the Tour/DSP will revert to its intended mode as soon as the magnet is removed. Initial signal acquisition is via a combination of digitized acoustics, one or two of the five directional indicators, and distance readout. The display shows between one and greater-than-three victim symbols. The Tour directional indicators and distance readout are displayed exclusively for the beacon with the strongest signal. Once that beacon is found, pressing a button marks/masks that beacon, and then the Tour focuses exclusively on the next-strongest signal. The only way to erase a mark is to switch the beacon out of Search mode (and into Transmit), then (quickly — for reasons that should be obvious!) back into Search. The Tour and DSP have the longest consistently reliable, fully directional range of any beacon on the market. What do I mean by reliable? I have run some range tests in which other beacons essentially matched the DSP when the beacons were positioned relative to each other (coupling) for the best signal. But in the opposite case the DSP has a very small range drop-off compared to other brands across many different range tests. The third antenna eliminates all spikes and nulls in the final search phase. The distance readout usually goes down only to a 0.3 reading (instead of the 0.1 that it seems to be capable of, or the 0.0 that some other models display), but the box size is still very small at about a tenth of so of a square meter (i.e., the area over which the same distance reading will be displayed). The Tour/DSP’s marking/masking has improved significantly over its many firmware versions, and now works reasonably well. But compared to the newly abundant signal separation competition from other companies, in a close-proximity triple-burial (which I consider the toughest yet still realistic test for signal separation beacons), the victim count is not as reliable and the marking/masking button does not always take effect upon the first press. Furthermore, although older F1 beacons can cause more persistent undercounting and/or ghosting for all signal separation beacons, the problem is more pronounced for the Tour/DSP. The Tour/DSP is supposed to display a symbol for such a beacon to indicate possible lack of confidence in the information Tour/DSP displays. Nonetheless, often when searching for an F1 I just end up with three regular victim symbols instead of one “old beacon” symbol. Then again, the Tour search function has fewer potential distractions then most of its competition, so as is often the case, it’s a matter of trade-offs and personal preference. Most notably, the Tour/DSP performs so well in my “5-25/5-20 Walk-the-Line Test” (see my test notes for details) that it doesn’t even seem like a test at all for the Tour/DSP. Specifically, this search configuration examines whether a searching beacon is so fixated on the first close-by signal that it acquires and subsequently marks/masks that it subsequently has trouble (to various extents) finding the next, further-away signal. But not the Tour/DSP, which nearly instantly at the starting point displays two victim symbols, then after marking the first signal (albeit often requiring a second press of the button) immediately displays the direction and distance to the next, further-away signal. The Tour has wide appeal. For a single-burial search, it functions in a simple, straightforward matter, and the marking/masking feature has improved significantly over the years (in its DSP incarnation). The range at which full directional indicators function is impressively reliable. Alternatively, by paying an extra ~$100 for the original DSP version, you gain a frequency tester (very useful if your partners have older beacons — which they shouldn’t, but such is the reality sometimes), a scan feature (which counts the number of transmitting beacons in three different radii and simultaneously erases any marks on those beacons), and the capability to search for the new Pieps TX600 alternative-frequency transmit-only beacon (for dogs or stashed gear). 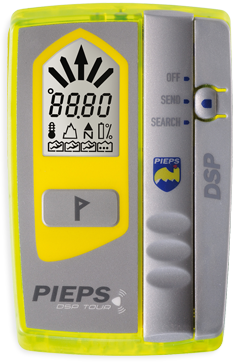 A victim’s Tour/DSP (or Pieps Freeride) transmission can also be temporarily suppressed by the Pieps iProbe, which is essentially a probe with a miniature search beacon in its tip. The iProbe can detect the signal from any beacon, and works the same way regardless of what beacon the searcher has, or even if the searcher has any beacon at all. More, for a guided party equipped entirely with the Tour/DSP (or Pieps Freeride), a guide with an iProbe could reliably suppress any located victim’s transmission so that the signal would now effectively be marked/masked for all other searchers too. (This feature is pretty nifty to demonstrate: turn a Tour/DSP or Freeride to transmit, set up a bunch of people standing nearby with their beacons on search, press the mark/mask feature on the iProbe, then watch as all the other searchers’ beacons go silent.) Key feature though is that if the iProbe is moved away from the target beacon, then the beacon will begin to transmit again. So the victim’s signal will continue to be suppressed only so long as that iProbe is in place showing the victim’s location. Shop for Pieps DSP avalanche beason. is anyone skiing these days? how about a trip report? Trip report on tap for tomorrow, foamy snow! Thanks for another thorough review, Jonathan – sounds like a beacon I would consider for my son. PS I only get two victim symbols when searching for my old F1 Focus with my regular DSP, but the F1 is very close to the frequency drift limit . . . The DSP is rock solid. 95 out of a 100 time when I get in range to pick up another beacon, the DSP arrow is pointing in the exact direction and giving a close range. You really can run the straight line til your audio signal gets excited for pinpoint search stuff. Its a real fast finder. Works for up to three for me. In very close burials where masking is an issue, I have had success with Steve Christie’s Three Circle Method with the DSP. Pieps DSPs are really the STATE OF THE ART beacons. Last month I was able to do some side by side tests for the newest beacons. I found Pieps DSP and DSP tour the best. They had the longest range (first signal detection distance) and superior accuracy during pin point search. Only problem I experience, was some water condense behind the display. But these were test beacons going in and out from warm hut all the time. Pieps could be even better with some sort of Tracker type of loud and bright display. I have heard and read that the TOUR has 10m less max range compared to pure DSP. Is this true, or is it changed by latest software version?? I cannot recall that we notice any major difference between Tour and DSP’s max range. I just heard that thing later. Yes, I really wish my buddy has Pieps DSP (tour) and I’m always willing borrow him my old big BD tele bobcat shovel too ! Toby, the official recommended search strip width is less on the Tour, but by itself that’s pretty much meaningless. (I might write a blog post soon on search strip width.) Any variation I’ve seen in my own tests or other published results for the Tour vs DSP range is well within the variation you can get in back-to-back trials with the same beacon. There appear to be lots of problems with the Pieps in 3 burial scenarios. I’ve seen beacons dropped entirely from the DSP during testing. Tests at the German institute for Snow and Avalanche Research indicate that searchers failed to find the 3rd beacon in 23 of 40 tests….the worst performance of the four “simplified” beacon models tested. Hi Skip, this is really weird and confusing. I personally experienced something totally opposite. We had absolutely best results with DSPs. I read later that the DAV, German Alpine Club (by the way: the world biggest sport club) has been tested the Pieps DSPs (twice) as the best of the rest, Mammut was very close or as good. Again,..Your linked report of Kassenstrüzt that is Swiss made (as is Mammut) is really confusing me. I have no other change than thrust DAV testers and what I have seen in live. Pretty nice. I’d like to practice with one of these at a beacon practice park. or is it so that TOUR is lacking some performace vs. DSP std. that has top performace? In the history of Public Relations, whoever changed the beacon narrative over to this endless emphasis on multiple burials should win the grand prize for obfuscation of reality. At least in the video linked above, some people are shown shoveling! I haven’t seen anything to contradict the suspicion that the DSP Tour is anything other than the regular DSP but with only one button on the control panel (and a lower price tag on the box). I’d be very careful with paying much attention to how a beacon does on the third signal of a three-person burial. That’s like worrying about how well your running shoes will do in the last mile of the Hardrock 100. For the vast majority of us, it simply will never matter. More, if you happen to decide to DIG UP the first person you find and turn off their beacon, golly, all the sudden you only have two signals to find! And I think it’s a valid question: do you search for everyone first then start digging, or start digging on the first hit? Or, perhaps carry an iProbe or two in the party? I have a DSP and love it for performance and ease of use, BUT the only complaint is the elastic lanyard is captured by a grey plastic top plate glued in a few tabs to the main body. One of those glue tabs has broken on mine. I have not patched ‘er up yet with some sort of gooey adhesive and worry about dropping and loosing it in the meantime. @Lou, I believe the prize you’re offering could be offered to the manufacturers themselves. They’ve done such a great job improving the way we search for one or two beacons. Seriously, single and double burials are a breeze compared to the pre-digital age. Now, in order to stand out in a competitive field, they companies are putting in new features that are specifically designed to handle the “obfuscation of reality” to which you refer. Your argument about multiple burials is out of touch. To imply that the avalanche community need not worry about multiple burials is narrow-minded. It’s like saying that most of us will never be in a car wreck, so we shouldn’t worry if our seatbelts are made of inferior materials. Or for that matter, that the EMT’s who will care for us shouldn’t worry about wearing gloves, since the vast majority of calls don’t involve people with infectious disease. It’s not about percentages when you’re dealing with something that can save lives. It’s about making sure equipment does what it claims it will do. Furthermore, your implication that you’d be the ONLY person working a rescue situation blatantly ignores the reality of today’s world. There are countless instances where more than one rescuer will be on hand for multiple burials. I shouldn’t even have to say this, it’s so obvious. Sure, it might happen that you’re the only one, and in that case you’ve got some quick thinking to do. But the reality is that there will often be others around who can probe or dig while you (or you and some others) continue searching. Ultimately, users have a responsibility to be familiar with their equipment, and manufacturers have a responsibility to put out reliable products.Even if only a small percentage of a certain model is defective, we should be skeptical of all units of that model. That’s how it works with ground beef, automotive recalls, tainted pharmaceuticals…and it’s how we should hold beacon manufacturers accountable as well. Until that happens, I’m not going to take any single person’s word that certain beacon is 100% reliable, all the time. Jeff is definitely in a position to be highly concerned about having to search — along with multiple rescuers — for multiple buried victims. Then again, many of those victims where he is most likely won’t even have beacons (although that’s changing … I hope?). But like Jeff says, he has to be prepared for the worst-case scenario from a beacon search perspective, and dismissing it as unlikely is of little comfort to someone potentially in that situation. Jeff, I hear you, but how many multiple burial victims should it be capable of searching for? Two, three, five, a dozen? Just because it hardly ever happens to a dozen, it still should do so and we should listen to endless competition between beacon makers as to why their ability to find 12 buried people is better than the other guy’s? I understand your logic, but extend it. My point is how much emphasis do you put on the rare occurrence, as opposed to handling the more common better and better? I feel like the multiple burial idea and resulting narrative has obfuscated reality, and admire whoever changed the narrative, though I’m unhappy they did so. I’d agree that at this point it’s terrific having most beacons deal well with a couple of signals as perhaps most commonly that’ll help deal with folks running around hysterical and not switching their own beacons to receive. But isn’t it time to change the narrative and put some emphasis on something else? Perhaps beacons could be made so accurate and fast it eliminated the need for a probe and thus speeded up the search, for example? Or perhaps some cool feature we can’t think of but a smart engineer can come up with? As for the automobile analogy, should they build cars to handle the rare but real occasional airborne leap 500 vertical feet off a mountain road, because yes it does happen? As for being prepared, anyone with any sense of reality knows that in a multiple burial you’re going to need more than marking and masking. Airways and O2, for example? Satphone? I get the feeling in all this that beacons are still getting treated like some kind of life saving talisman, when the reality is just the opposite. Let me also state that I’m not immune from doing things that do expose more than one person to hazard. When I don’t have any say in the situation, say when being guided in Europe, it does happen. But those situations if they do result in multiple burials are utterly and totally negligent, I bum out every time I get forced into one, and do my best to keep them from happening so they are quite rare in the total number of days I’m out every winter. As for my own travel with core group, we’re danged careful to expose one person at a time to hazard, but yeah we could make a mistake. Even then, In that case, how important are multiple burial features? I’m actually not sure they’d make much if any difference in mortality, as it takes so long to dig a person out no matter what method you use to find that first signal and the ones after. I guess what I’m saying is that beacons work good enough for that stuff — it’s time to move along to something else. P.S, I agree about holding manufacturers accountable. They freak out on how the web sometimes over-emphasizes things that are perceived as “problems” and sometimes in their view actually are not. But they need to master the media so they can present their case in a cogent fashion, and when there actually is a problem, they need to go public with it immediately and be very public about fixing it. I think that’s happening more and more as the PR people and those in charge learn and sometimes mature (grin). And guys like me are learning as well, about how to present problems or perceived problems in a way that’s not pandering click bait, but rather something constructive for everyone. It needs to keep improving. For beacons, but also everything from ski bindings to climbing skins. I agree with Lou; risk management is an integral part of backcountry skiing, and, when skiing potential avalanche terrain, the most important thing is to ski one at a time through the avalanche risk area. It’s far better to have 3 people rescuing 1 buried person, than to have 1 person attempting to rescue 3 buried persons. @Lou . . . . regarding your couple of posts above, that was very well said. The real or important issues have been obfuscated or altered in proper focus. Multiple schmotiple, let’s move on. Thanks for the kudo’s, Lou, on steering the conversation to multi-burials! 😉 I did so due to an overwhelming sense from the prior posts that the Pieps beacon was perfect. All beacons have their strengths and weaknesses, a point would should be understood by every consumer especially when searching for advice from various internet sites which may or may not have biases and rigorous test methods or relevant criteria for testing. Multi-burial concerns are very real to many consumers, esp. patrollers, guides, rescue service members where avoiding the hazard is unfortunately not always an option. Obviously, beacons and rescue play second fiddle to terrain assessment and weather and snowpack considerations. Obviously, thoughtful triage techniques should be implemented in worst case scenarios. Multiple burials and auto-revert functionality should work well and as advertised. Maybe in this case they always do though, like most beacons, the Pieps is likely to have some shortcoming for someone. I thought the link to the study might help folks looking for more information on beacons. Am I skeptical of the study, yes. Am I skeptical of advice given by people on the internet? Absolutely. Still, the study loooked thorough and may be of value to a potential beacon shopper. Oh, and how about those new La Sportiva rando race boots?! Skip, points taken. All that happened is you got me going on my opinions about over emphasis on this multiple burial stuff. I fully agree that it could be an issue for some people. My view is that it’s pretty much moot. With practice, any modern beacon can be used to find a couple of buried people. Time to move on, is all I’m saying. And yeah, if something actually _doesn’t_ work as advertised, then that’s a good point and I’m glad you are exploring that issue. Keep doing so here in the comments, fine by me and useful for our readers. Ultimatly, if a person is truly concerned about finding more than one person, they can buy a beacon mailorder, throw a couple of other beacons out in a parking lot, and test themselves. Beyond all the fancy stuff, that type of test is valid, especially if repeated a few times with variations on the theme. If they don’t like the beacon, they can return it. Lou, I’m not going to let you off the hook that easily. 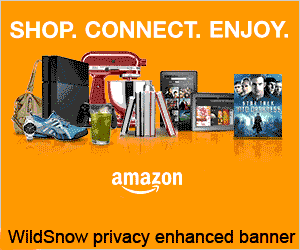 You run a popular site that’s used by many, pros and amateurs alike, for information about snow safety and avalanches. It’s your blog, you certainly have a right to steer the discussion wherever you see fit. But some, myself included, feel there is sufficient misinformation out there to do what can be done to clear some of it up. I think this discussion is what you’re viewing as an overemphasized focus on multiple burials. I don’t think the focus is misguided when one separates the discussion from the greater avalanche issues and simply looks at a beacon’s effectiveness. I think you missed the point of my automobile analogy. I’ve never once heard an automaker state or imply that their vehicle will protect me from a 500 foot vertical fall off a cliff or anything remotely close to that. But I have seen repeated examples of beacon manufacturers making claims that their product can separate and filter out X number of beacons. In many scenarios, the units work as they should, but I’ve seen instances with these beacons where the marketing pitch doesn’t match my experiences. I am fortunate to be in a position to be able to spend a lot of time testing different beacons, as well as talking with people relatively new to backcountry travel and avalanche safety. I’ve talked with lots of people who misunderstand the capabilities of their beacons. Part of the blame goes to the consumer for not training or reading their manual, and part of the blame belongs to the manufacturers for the emphasis on their model’s ideal performance capabilities. Overall though, the point is that the manufacturers have a responsibility to put out products that do what they claim to do. Show me one car ad where someone walks away from a 500 foot drop and I’ll happily buy you a beer. Or two. So where to stop with the multiple burial problem? I’ll leave that question to the ones who design the beacons, provided they do what they say they’ll do, each and every time. Sure, beacon searching is a very small part of the overall rescue scenario, but it’s one that you’d better be effective at if you want to have any chance at all for a live rescue. I’m not trying to ignore all the other pieces in order to focus on an interesting though not very likely scenario. Accident avoidance, other safety devices (e.g. avalungs and airbags), first aid, evacuation…all these contribute to a successful rescue and should not be overlooked or ignored. Lou, I just saw your comments above after posting mine. Everyone who buys a beacon because it has some feature or another should practice with it and learn how it reacts under those circumstances. The point isn’t a moot one, but there other things people can be spending their energy on before they geek out on the high-end features. Jeff, ok, I totally agree that a safety product should work as advertised and claimed by the maker. I also agree at this point in my own philosophical evolution (grin) that multiple burials are something to consider in avalanche safety. So we agree on those points. Where we differ is I think there is too much (way to much) emphasis on multiples, both in the industry and the avalanche safety community. I also agree there is the potential for multiple burials, and yes of course they happen. But to expect beacons, no matter how good, to result in significant reduced mortality in multiple burials is wishful thinking. Thus, sure, all modern beacons can find multiple avalanche victims. But to repeat, I think this is over emphasized and the resulting narrative is doing a disservice to the consumer. Agree we should be thinking about “what can happen.” If one is intellectually honest in that exercise, they’ll look at potential for multiple burial and realize people will die, and it’s best to put vast amounts of energy and thought into avoiding ever being in the situation where a multiple could happen on your watch. After that, enjoy throwing 12 beacons out in a parking lot and see who can find them the fastest. Perhaps that exercise is good preparation for Europe and I should be doing it (grin). Keep me wriggling on the hook. That’s my job and I love it. Is this one of those debates in which nobody can remember what the original point of contention was? – Agreed. And the flip side is that every single beacon I’ve ever tested will exhibit some erratic behavior at least some of the time in some situations. The tricky part of beacon testing is determining how frequently the erratic behavior occurs in which tests and how representative those test configurations are to occur in real searches. If you just toss a few test targets in a open field and run through a few searches, you might end up with far confidence in the searching beacon than is merited. – As long as that behavior continues to occur, we’ll still have multiple burials … sometimes in close proximity, sometimes not, but the ability to conduct a close-proximity burial is important, whether via a specific function on your beacon or with your own searching skills. As for the automobile safety analogy, modern technology has rendered survivable such horrific accidents that from the perspective of early cars they might as well have been the equivalent of the cited 500′ drop. Still better to stay out of an accident in the first place (whether vehicular or avalanche), but who knows how future technology might be able to save us … from our own mistakes! I have the DSP Tour. I am the greenest of green novices to the back country and wanted an easy to use beacon that had the possibility of marking in the case I really f***ed up and was in a multiple burial situation. The long range and the marking capability is why I selected the Tour over the Tracker 2. I have practiced consistently at the beacon parks here in the Wasatch and it is exactly what I was looking for in a beacon. I may have wanted more if I were more experienced but I am not sure why that is necessary. I was going to get the Tracker 2 because it seemed slightly faster but in the end the Tour didn’t seem much slower and had the marking feature. So far, very happy with it. Read a review on REI from a customer saying that some Motorola radios can switch the beacon mode and post a reference http://alaskarescue.wordpress.com/2009/01/26/pieps-dsp-and-motorola-radio-problems would that be due to magnetic interference? Also the user reviewing the product said that there is an issue with Ortovox beacon that will show up as multiple signals on the DSP, only one being correct. Have you had any experience with those issues? Does the DSP or DSP Tour has an autorevert to send mode feature? It looks like PIEPS wants you to use the backup beacon instead of using autorevert feature. But is the feature present on the DSP/Tour?